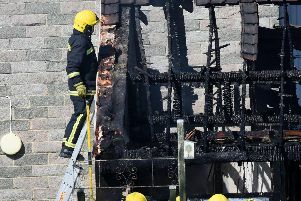 A Gosport house is ‘completely gone' after a blaze ripped through home. Hampshire Fire and Rescue were called to the blaze at a home in Nyria Way at 12.01pm today and remain at the scene. Twenty-six firefighters and six fire engines from Fareham, Gosport, Cosham and Portchester are currently battling the fire. Dan Harbut, 31, from Lee-on-the-Solent, saw the devastation. He said: 'It's literally just the frame of the house left - everything else is completely gone. People are being advised to avoid the area in Gosport this afternoon. The fire in Nyria Way is near Walpole Park and the Asda Superstore in Cranbourne Industrial Estate. Pictures from the scene show the fire has caused significant damage to the home. They also show that a Hampshire and Isle of Wight Air Ambulance has landed close to the scene. We’ll bring you all the updates on this fire this afternoon.